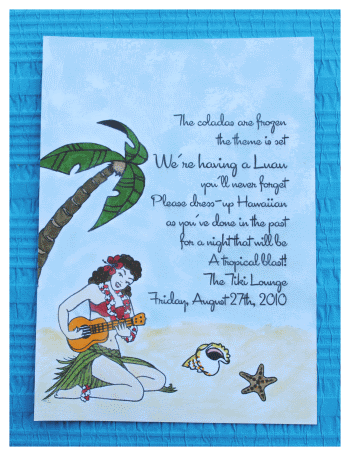 Who doesn't love a good luau party or the great handmade invitations that come along with it? I came across this great rubber cling stamp from a little place online called Bomshell Stamps which features very fifties-ish and pin-up style vintage art. Very reminiscent of old sailor tattoos! I just could. Not. Resist. Pretty much every shop they have is fabulous but when I caught a glimpse of this great hula girl stamp my wheels started to turn and the result is what I came up with here on this page! I started by printing the wording for my invitations on some plain old white cardstock. I set them up to print two invitations to a page on a standard 8 1/2" by 11" sheet of paper. You can do the same by using one of our free printable invitation templates. Our templates allow you to set the text two or four to a page with the page facing portrait or landscape. Enjoy! OK, so to get back on track, after print the wording for the invitations I used a paper cutter to trim them down to a 5" by 7" flat card. Since the stamps I purchased from Bombshell Stamps are cling stamps I got out my extra large acrylic stamping block, as well as some good, high quality black stamping ink. I laid my block on top of the invitation so I could get a clear idea of how much room I have to play with the stamped images around the type. 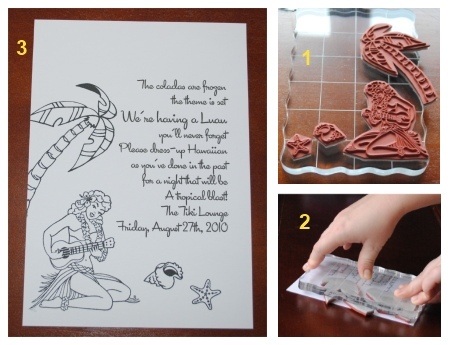 I used several of the stamps arranged onto the block to create these luau invitations. Once I had the stamps arranges how I liked them on the block I turned it over for a dry run just to make sure I could fit the images onto the card without covering any text. I then inked up my stamps and went to town! I chose to stamp my images and then go hog wild adding color and texture. 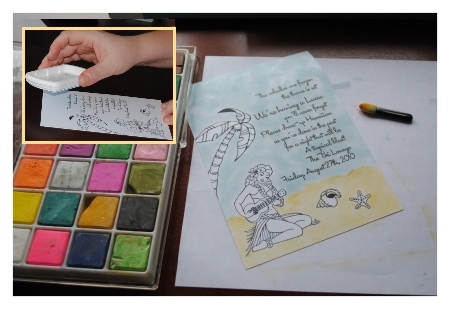 But for more simple, easy-to-make handmade luau invitations, I think you can easily just go with a brightly colored ink and leave the image as is. The image is so cool that it pretty much stands alone. Really it's up to you how far you want to take it! But if you are like me and just have to take it all the way... Read on. After stamping the image I decided to add some sky and sand. I knew I wanted to color the images in, but I couldn't bring myself to leave the background blank. So here's what I did. I used a chalk ink pad to blot the ink straight onto the card. The block is so big that IU could only get the larger areas at first. I had to make sure and use a very light hand, too, to give it that airy cloudy look. To fill in the smaller areas I used a make0-up sponge and dipped it into the chalk ink. I also used the make-up sponge to bland the ink on the page a little better. For the sand I used some blending chalk. Blending chalk is pretty much just dry chalk that you apply with a brush or applicator. If you are short on cash you can pretty much just buy an appropriate colored piece of chalk, brake it in half, and use a Q-tip or eye shadow applicator to blend the chalk onto the page. I much prefer the chalk made expressly for this kind of project, I have to admit. It may cost more but it will be easier to use, and probably blend a lot easier. To finish the project up I got out some art markers I keep on hand and I simply colored everything in, aside for the hula girl's skin, in which I used the blending chalk. But if you have a flesh colored marker, go for it!